The Digital Research Library of Illinois History Journal™: Two Different Riverview Stadiums at Different Times in Chicago's History. Two Different Riverview Stadiums at Different Times in Chicago's History. It appears that there were, at different times in Chicago history, two Chicago racing stadiums. 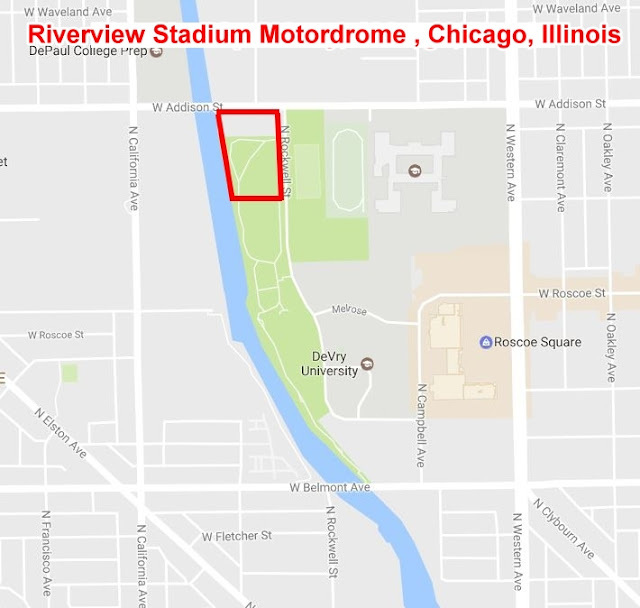 The first being called the Riverview Stadium Motordrome aka: Riverview Stadium which adjoined to Riverview Amusement Park in Chicago, Illinois in the early 1900s. The second stadium was known as Riverview Speedway which opened in 1936. Both stadiums literally have nearly the same footprint, and both are discussed here. 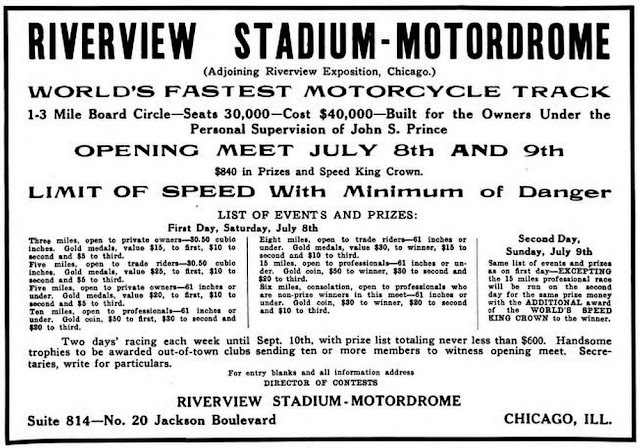 Chicago Franchise wanted by both the Riverview Stadium Motordrome and the Chicago Motorcycle Club. A Rather peculiar situation has arisen in Chicago bearing upon the award of an exclusive board track franchise for that city. 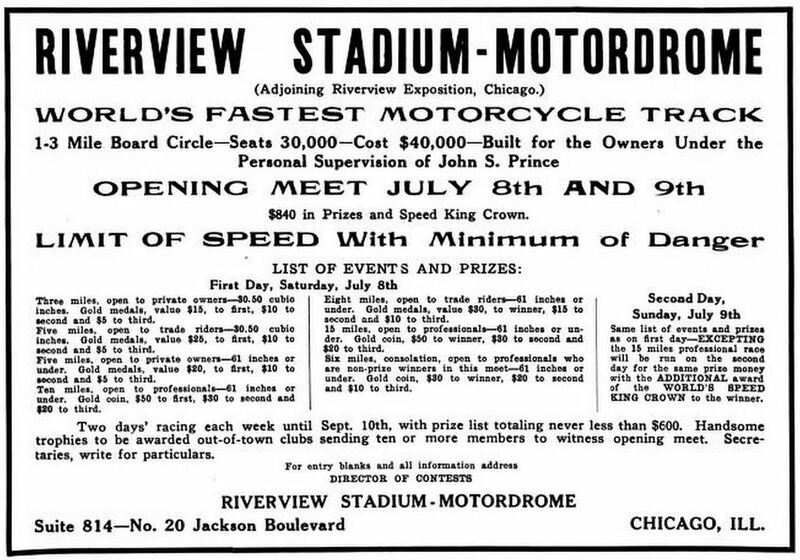 Such a franchise is wanted by M. W. N. Johnson, now sole owner of the Riverview Stadium Motordrome, and also by the Chicago Motorcycle Club, which would like to build a track on the south side of the city. The Chicago Club, however, has not yet secured a site for its proposed track. On the other hand, the Riverview Stadium Motordrome management is ready to hold its inaugural meet in July. The Riverview Stadium Motordrome settled on the northwest corner of the Riverview Amusement Park property. It bordered by the North Branch of the Chicago River to the west, Rockwell Street to the east, Addison Street to the north and approximately where Cornelia Avenue would be located to the south. 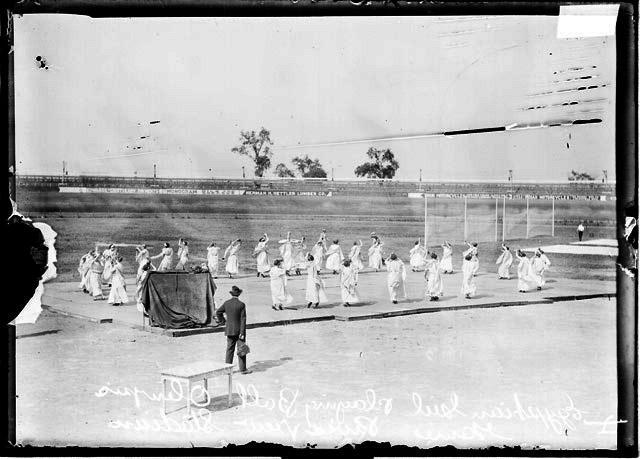 View of a group of girls wearing costume dresses standing in a circle around the perimeter of a surfaced area during a local competition of amateur athletes from the Chicago area only that was called the local "Olympic Games" and was held only on June 14, 1913, at Riverview Stadium Adjoining Riverview Amusement Park in Chicago, Illinois. About the middle of April, Chairman Thornley signed a draft of the agreement adopted by the F. A. M. (Federation of American Motorcyclists) Board of Directors suggesting that it be executed at that time. However, there was some litigation then pending relative to the ownership of the track, and the execution of the exclusive franchise agreement and the payment of the fee was deferred. 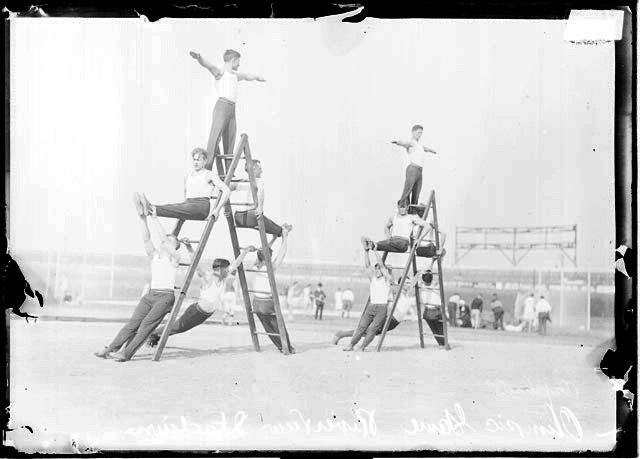 View of two groups of young men performing a gymnastics routine on two ladders in a dirt or sand lot during a local competition of amateur athletes from the Chicago area only that was called the local "Olympic Games" and was held only on June 14, 1913, at Riverview Stadium Adjoining Riverview Amusement Park in Chicago, Illinois. Late in April, a settlement was reached, whereupon Johnson wired $1,000 to Dr. Thornley, $750 in payment of the franchise fee and $250 to make up a purse which, as announced last year, was to go to the professional driver winning the largest number of races. The winner of this prize is Joe Wolters. Johnson has also made application for six sanctions, and Chairman Thornley will undoubtedly decide in his favor, unless he receives formal objection within thirty days, from a majority of the members of the Board of Directors. The Riverview races will again be refereed by H. T. Roberts. Riverview Speedway 1936-1942 (aka: Riverview Stadium), 2601 West Addison Street, Chicago, Illinois. Riverview Speedway was located on the northwest part of the Riverview Amusement Park property which was nearly the same footprint as the former Riverview Stadium Motordrome. Chicago's Riverview Speedway or Riverview Stadium was one of the finest midget auto racing tracks in the country, but had a short life of seven years. The track’s grandstands would eventually seat 12,000. Chicago businessman and sportsman, Thorne Donnelley, and others were behind the project. Donnelley, president of the Midwest Auto Racing Association, announced that the new speedway would be the association’s “home track” for the 1936 outdoor racing season. Donnelley, son of Reuben H. Donnelley, Chicago’s publishing and printing magnate, was involved with midget racing from the start in the Chicago area, owning midget race cars. Jimmy Snyder was his driver. Opening night at the one-fifth mile dirt “speed plant” was on Sunday evening, May 24, 1936. 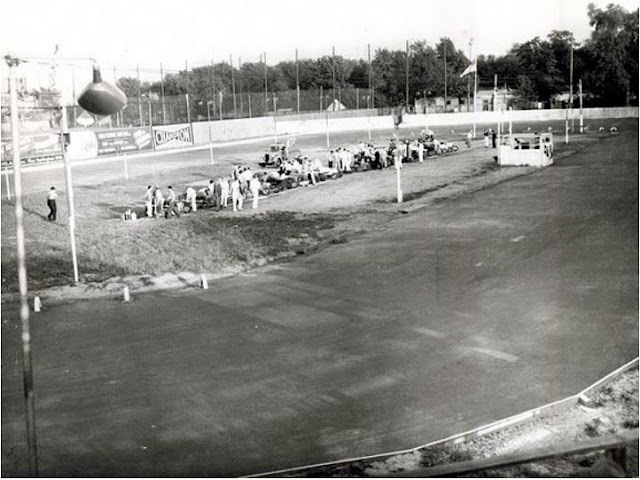 Midget racing was in “full bloom” in the Chicago area with the Lincolnwood Motor Speedway (aka: Chicago Midget Speedway), at Pratt and McCormick in Lincolnwood, also hosting a midget racing program that same night. Jack “Curley” Mills of Los Angeles, a pioneer of midget racing, dating back to some of the earliest midget races on the West Coast in 1934, won the 40-lap inaugural main event at Riverview, besting Bob Swanson, Pat Warren, Chicago’s own Jimmy Snyder and Johnny Sawyer. Swanson, the West Coast champion considered by many to be one of the greatest midget drivers ever, defeated Snyder, Chicago’s 1935-36 indoor midget racing champion, in a special four-lap match race. A capacity crowd of 8,000 witnessing the races. The track’s grandstands would eventually seat 12,000. Just for the record, Paul Russo won the feature race at the Chicago Midget Speedway that same night, defeating Cletus “Cowboy” O’Rourke and Everett Rice. The 1936 schedule called for races every Sunday and Wednesday evenings. By season’s end, the track had seen over two dozen events held with Snyder being named the track’s overall champion for the inaugural season. The season finale was held on September 27 with Art Hartsfeld of Toledo, Ohio grabbing the win over Marshall Lewis and Robert “Shorty” Sorenson. The 1937 season at Riverview Speedway opened on May 23, 1937 with Hartsfeld being the winner of the 40-lap main event ahead of Russo and Ted Tetterton. Another busy schedule with racing every Sunday and Wednesday was seen with the likes of Russo, Lewis, Ray Richards, Frank Beeder, Wally Zale and Ted Duncan among feature race winners. Hartsfeld claimed track championship honors. Harry McQuinn of Indianapolis was the “guy to beat” at Riverview Speedway in 1938 as the track ran pretty much a one night a week schedule on Sundays. McQuinn wheeled the Wisconsin-based Marchese Miller No. 4 midget to the overall track championship. Bob Lundgreen and Harry Zoern were the promoters that season. The Riverview track was the only Chicago area speedway to hold weekly midget races during the season with the new Raceway Park near Blue Island hosting its inaugural program on September 24, 1938 with McQuinn grabbing the “opening night” 40-lap feature. A few weather-related postponements caused the 1939 racing season at Riverview Speedway not to get underway until June 4 with Wisconsin ’s Tony Willman in Fred Tomshe’s Offenhauser-powered midget taking top honors in the 40-lap feature over Jimmy Snyder. Snyder was coming off of a great run at the Indianapolis Motor Speedway on May 30, finishing second in the 500-mile classic after grabbing pole position honors after a record qualifying effort. 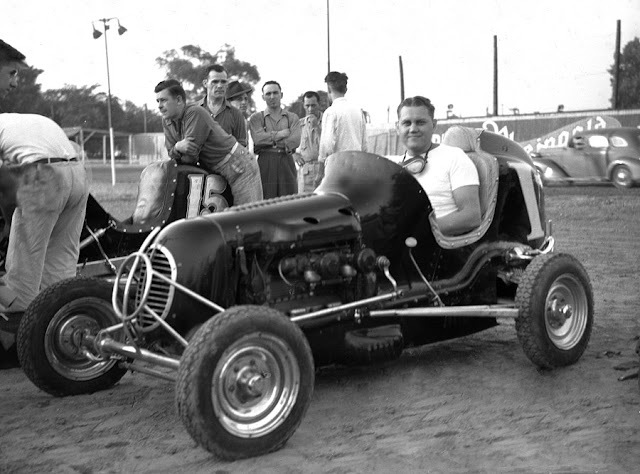 Less than a month later, Snyder would lose his life in a midget racing accident at Cahokia, Illinois, at 31 years old. Chicago ’s Wally Zale captured track championship honors for the 1939 season. Zale, along with Willman, Lyle Dickey and Ray Richards were feature winners during the year. Richards won the 75-lap championship chase on September 10th in his Marchese Miller midget. Zale nailed down his second consecutive Riverview Speedway track championship in 1940, sharing feature win honors with the likes of Ted Duncan, Ray Richards and Bob Muhlke. The season got underway on June 2 with Duncan in the Tomshe Offy claiming top honors in the 40-lap feature. Zale in his own black “Offy” No. 1 won the season finale on September 15 over Duncan, Muhlke, Myron Fohr and Tony Bettenhausen. The “rough and ready” Zale was reported to have won a total of 67 midget feature races during the 1940 season. Chicago's Wally Zale was the area's most prolific midget racing feature winner from the mid 1930s until his passing in 1942. Zale, nicknamed “The Human Cyclone” during his heyday, established a single season feature win record of 67 in 1940. Zale was credited with 178 midget victories before his death in a double-train/car collision. Zale is pictured here at Chicago's Riverview Stadium in 1940. With the War in Europe seemingly getting closer to the United States day after day, Riverview Speedway kicked off its sixth season of midget racing on May 18. The 1941 season opener saw Ted Duncan in the Frank Podriznik No. 15 “Offy” win the 30-lap feature race over Jimmy Caris and Bob Muhlke. Duncan would post track title-winning efforts in 1941, using a 100-lap victory on August 31 to propel himself to the track championship. Duncan, along with Muhlke, Ray Richards and Myron Fohr, were feature winners during the season. The 100-lap season finale was won by Richards on September 21 as he defeated Duncan, Muhlke, Pete Nielsen and Shorty Sorenson. Richards, who grabbed fast time honors during time trials with a lap of 15.58 seconds, covered the 100-lap distance in a record 26:30.80 minutes. With the United States now in World War II and automobile racing seemingly ready to be halted any day, Riverview Speedway opened the 1942 season on Sunday evening, May 24, after being rained out the week before. Former Golden Gloves boxing champ Jimmy Caris of Chicago wheeled the Hopkins Offy to victory honors in the 30-lap feature ahead of Ray Richards and Bob Muhlke. Hailing from Highland Park, Illinois, Richards, behind the wheel of his Leader Card Offy No. 5, would garner track championship honors during the track’s final season. In addition to Richards and Caris, other feature winners were Myron Fohr, Cletus “Cowboy” O’Rourke, Ted Duncan and Tony Bettenhausen. Richards scored a 100-lap victory on June 21, defeating Fohr and Muhlke. Another 100 lapper was held on July 19 with O’Rourke claiming the win over Bettenhausen, Richards and Al Cummings. 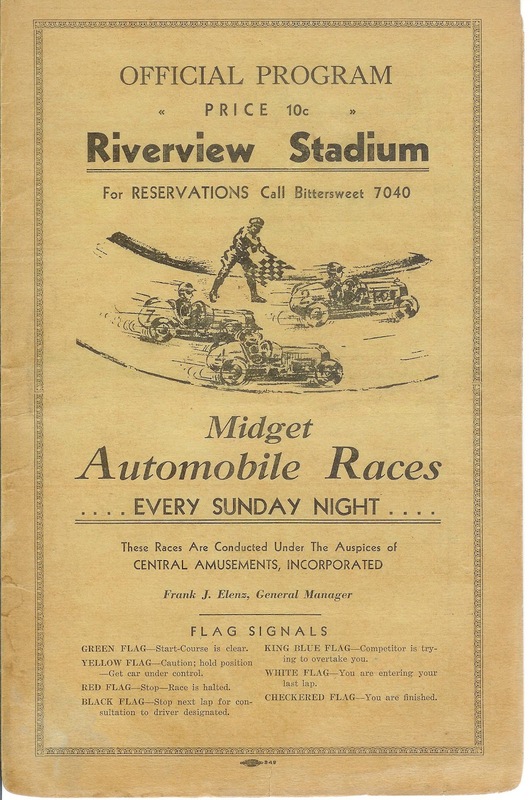 Wednesday evening, July 29, 1942, would mark the final racing program ever held at the Riverview Speedway oval as the U.S. Government ended all auto racing activities for the duration of the war. Tony Bettenhausen would have the honor of winning the final feature race at the track, wheeling his Muntz-Nichels Offy to the 100-lap win over Richards, Muhlke, Cummings and O’Rourke. He covered the distance in 25:03.07 minutes. Richards was awarded his track championship trophy that night and claimed top honors in the 15-lap “handicap” race. 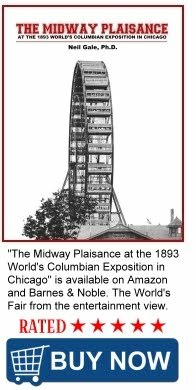 Who would have realized that when the lights were shut off that night, it would mark the end of racing at the popular speedway on Chicago ’s northside. The Riverview amusement park would last until 1967, but its neighboring speedway was just a memory after World War II ended.